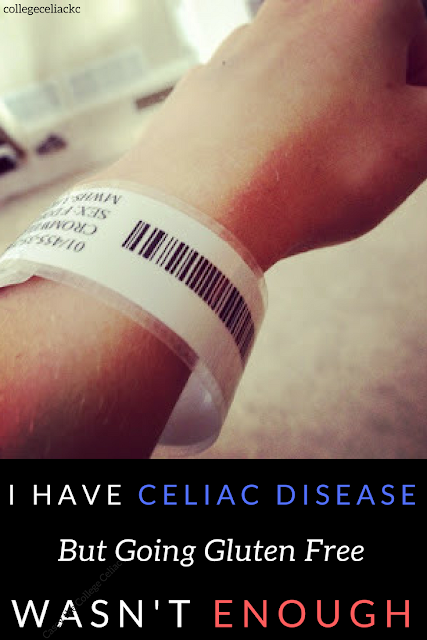 Even though it's been four years since my celiac diagnosis, one question always seems to pop up when I meet someone new. Something like: "You can't eat gluten? What do you even eat!?!" Whether it's celiac disease, a food allergy or a lifestyle choice like going paleo or vegan, "limitation" seems to be the common denominator. If you can't eat something, you diet just must be insanely restrictive. And in certain aspects, that's true. However, I have a different side of the story to tell. In fact, my diet has more variety than ever since I went gluten free. How can less ingredients mean more dietary diversity? And how can you add some spice to your life, even if you have food restrictions? Here's four reasons why I'm eating more types of food than ever...after celiac forced me to go gluten free. 1. You're forced to get creative in the kitchen. How many times have you reached for the same ingredients or followed the same recipe just because "that's what you've always done"? Maybe it's the enchilada recipe that's been passed down in your family for centuries...or maybe it's just an American classic like grilled cheese that you've never bothered to make your own. Food for Life - to replace the flour ones you've used for years. You may even have to try entire new recipes, experimenting with foreign names like buckwheat groats, chia seeds and coconut oil. The truth is, before I was diagnosed, I could cook approximately three meals: a baked potato, boxed mac n' cheese and any baked good that came with instructions. Being forced to go gluten free also forced me to leave my comfort zone of meat-potatoes-and-the-odd veggie. I wouldn't call myself a chef...but I do know how to pronounce quinoa correctly! 2. You have the best motivator ever to try new (naturally gluten free) foods. Maybe you've been gluten free for years, or maybe it's only been a few days since your edible world was thrown upside down. Either way, it's the perfect time to take a field trip to your local grocery store's produce aisle. I have another confession to make. Pre diagnosis, I had never tried avocado, kale, zucchini, squash, chickpeas and countless other foods. I turned up my nose at sweet potato and ate a smoothie once a year, if not less (how times have changed!). I ate a lot of food in terms of volume...but most of it fell within the realm of processed foods, canned vegetables and "stick-to-your-ribs" meat and potatoes. But, when so many of my old go-to's were made off limits, I discovered something: there was a rainbow of naturally gluten free options just waiting to be tasted. Sure, maybe your diet was more well-rounded than mine before you went gluten free. However, there's probably still one or two unique pieces of produce - ranging from dragonfruit to purple sweet potatoes to jicama to beets - that you haven't regarding including in your diet. It's impossible to not grieve for the foods - and, perhaps even more so, the ease of eating - that you've lost. Heck, sometimes I still smell my dad or sister's gluten-stuffed meal and and wish I could sneak a bite. But the more adventurous you get with safe foods, the less restrictive your diet will feel. I can now say that I eat zucchini, spaghetti squash, radishes, buckwheat, rice flakes, figs, avocado and countless other foods I'd never even heard of on a daily basis. And I have celiac - and the limited diet it gave me - to thank. 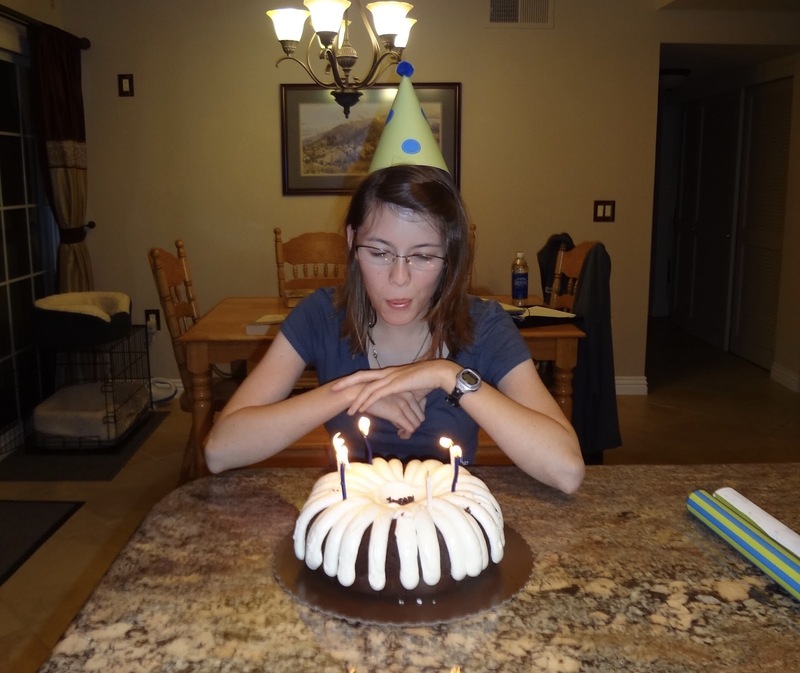 I've talked before about how much trust it takes to thrive with celiac disease. You have to trust restaurant chefs to avoid cross contamination and trust your significant other to brush their teeth before kissing you. However, the safety of your food really lies mostly within you - and the more you know about food, the safer you'll be. For instance, I know that couscous and seitan are made of straight wheat...and when I've been offered samples or have seen them at the Whole Foods bar, it's easy to quickly turn them down or walk away. I know that gluten can hide in anything from soup to BBQ sauce to dressings. And, because of that knowledge, I don't eat something thinking it "should be" or "probably is" gluten free. When I was first diagnosed, food transformed from tasty, enjoyable fuel to something scary - and even dangerous. Food could literally kill me, and I didn't feel ready to accept that responsibility. Ironically enough, though, celiac has taught me more about nutrition, food labels and dietary health than my high school or college nutrition classes ever did. And the more I learned, the more confident I became in exploring new foods and cuisines. Yes, food can be frightening when you have celiac, a food allergy or intense intolerance. But once you've educated yourself on what you can or can't eat, you're closer to feeling empowered enough to expand your diet as much as possible. 4. ...and you're in control of how restrictive you really want your diet to be. On that same note, you're also in charge of how restrictive you want your diet to be. This idea has especially been on my mind in the last few weeks, thanks to the Whole30 movement. 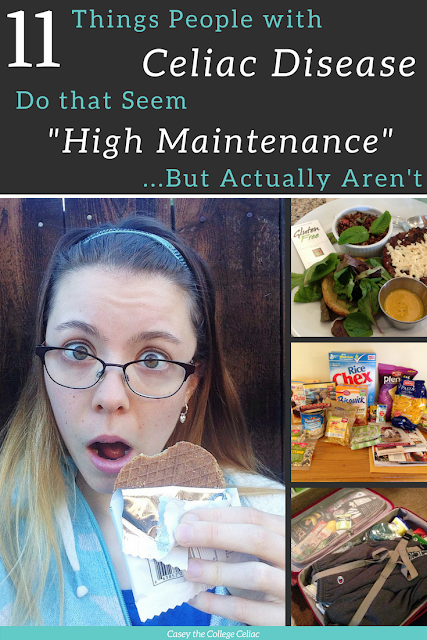 Every time Whole30 comes up, I can't stop myself from wondering, "Is that what I need to do? I'm eating more processed foods and sugar lately...maybe going full turkey is what my stomach really needs." At the same time, though, I know I don't need to jump on the Whole30 train. 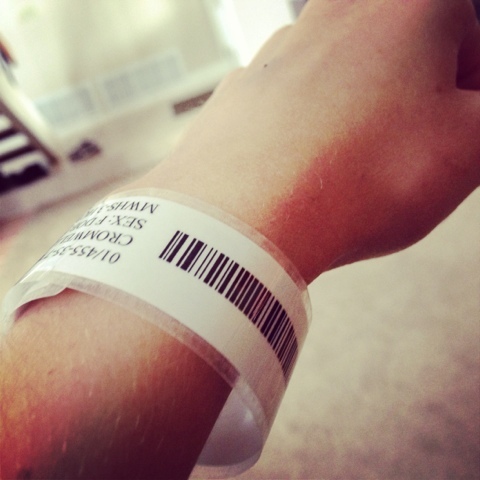 I'm healthy, my stomach has more good days than bad, and, to be honest, my diet is already freakin' restrictive enough. I never have gluten, rarely have dairy and often steer away from soy. Some of those choices are medically necessary; others just help me feel my best. I would never say everyone should eat like I do, but it works for me. The point of that two-paragraph rant? Basically, when you realize you are in control of your own diet, you may feel like you have more dietary options than ever. Despite my limitations, I have enough recipes bookmarked to last my whole life (though, to be honest, I'll probably never make them all). And, despite whatever limitations you have, your diet only has as much variety as you work for. That may mean putting extra time and energy into finding the perfect nut butter replacement for peanut butter, a breakfast that tastes like oatmeal but is free of oats or old family comfort food (mac n' cheese anyone?) that fits your new restrictions. But, at the end of the day, this time and energy is worth it when it makes your everyday life feel that much more free. When you're determined and excited about adding some new foods to your life, celiac ain't nothing more than a small speed bump. Even though I am constantly asked about what I really eat, I've yet to perfect my answer. Sometimes it's, "Everything - as long as it doesn't have gluten or dairy." Other times, I simply laugh and say, "You'd be surprised." Because, if these past four years have taught me anything, it's that my weekly meal plan can still boast plenty of gluten free surprises. Heck, I still have a long range of foods or recipes I need to try, from a cashew cheese sauce to pistachios (one of my favorite hobbies sophomore year was shocking my foodie roommate with the foods I'd never tasted. I'd you're reading this, Bri, I can feel your disapproving glance from here!). An honest portrayal of my two true loves: Sunflower butter and homemade granola! In a lot of ways, I'm even thankful for the diet celiac has given me. I'm eating healthier than ever before (at least in terms of getting more veggies and less red meat, sugar and un-pronounceable ingredients). I'm also eating a bigger variety of foods than I ever imagined. So, if you're feeling like your diet is dwindling after a medical diagnosis, I understand your pain. But I also have come to understand that we're the masters of our (foodie) fates in a lot of ways. And the first time you try a new, delicious food that also fits within your new diet? Let's just say that there's nothing sweeter than that. Have you ever found your diet expanding after it become more limited? What's your favorite trick to add more variety to a medically restricted diet? I'm always looking for new inspiration! Your experience pretty much parallels mine. 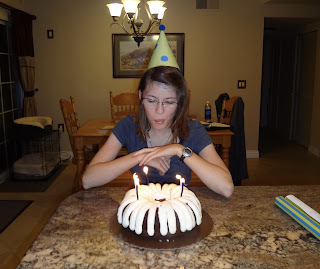 I've been GF (except for a few glutenings) since having my celiac diagnosis confirmed by biopsy 9/11/2013. And I've got more new (to me) and what some might call weird ingredients in the cupboard and fridge than I would have otherwise. Lots more. If I see something on Amazon that I've never tried (like the plantain flour and mesquite flour waiting for me to include them in some recipe), I frequently put it on the next order. I use cassava flour regularly, something that wouldn't have occurred to me BC. I'd never even heard of psyllium (is that some obscure element in rare earths section of the periodic table? ), much less the powder from psyllium husks that is so effective at holding baked goods together. Lots of people don't realize how easy some (certainly not all) recipe modifications can be to make dishes GF. GF soy sauce/tamari takes care of lots of oriental dishes. GF pasta opens up a whole realm of Italian things. Unfortunately neither one addresses the Pizza Problem, but that's where cassava flour and psyllium husk powder are a big help. And I'm definitely with you on having a lifetime supply of bookmarked recipes to try.